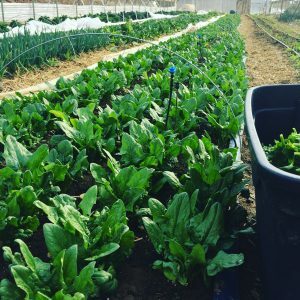 Spring has ‘Sprung’ in our high tunnels! We are busy planting & harvesting in early April on the farm. Lots of spring veggies in our tunnels are loving the longer days and the return of the sun. It’s been a wet cold spring outside so far, which has delayed our planting plans but we’ll be ready just as soon as the ground dries out to get lots of transplants in the ground! !